Sometimes I feel like I spend so much time reading photography tricks and tips online that I never see anything new anymore. So, I set out to make this useful collection of some weird and cool photography tricks that aren't your usual run-of-the-mill variety. I hope you find some joy and learn a new tip or two. When you're done, comment below with what cool photography hacks you've learned! Want to take a group photo but don't have a place to set the camera? 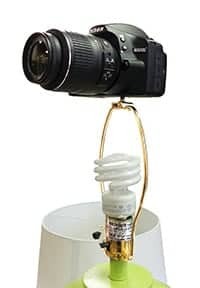 Just whip the lamp shade off a lamp and screw your camera onto the lampshade-holder. Not only will your party and indoor pictures look better, but you'll look like MacGyver in front of the group. Not bad. This tip doesn't come in handy every day, but you'll like the coolest photography nerd on the planet when the situation arises. Gets attention of the kids and you can give them a treat for looking at the camera! Shooting photos of kids can be quite the feat. It seems like they are interested in looking at everything BUT the camera. I have two kids of my own, and I know that the only way to get them to smile and look at the camera is with a good bribe. 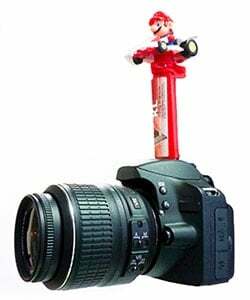 The perfect solution is to buy a simple PEZ dispenser on the hotshoe of your camera! The base of the PEZ dispenser is a tiny bit wider than a standard hotshoe, so you'll have to trim it just slightly with a kitchen knife before the shoot. Then, when the kids are being good and looking at the PEZ dispenser, you can have them come up and grab a little candy periodically during the shoot. It's pure genius. Turn your flash to FULL power! Sometimes you're out shooting portraits on a bright sunny day and the light just looks too… natural. I often find this is the case when shooting a wedding or engagement when I'm shooting at a park or other outdoor location and I get bored with the same lighting in every shot. One trick that I really enjoy is to turn up the power on my flash to the max. This will, obviously, make the subject extremely bright. If you change your camera settings to expose for the subject, it will make the background look extremely dark because the flash didn't hit it. This makes it look like it's night time even if it's the middle of the day. Click here to read a full explanation of this technique. This photo shows the lens held out from the camera so you can see what's happening, but you'll want to hold the lens right against the camera for this to work. This is the coolest camera trick I've seen in a long time. If you take off your lens and hold it in front of the camera, you get a macro lens! I was really skeptical about this, but I just tried it and it worked like a charm. 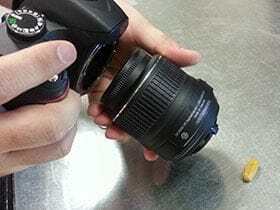 There are four things you need to know about using this trick: (1) Your camera won't take a picture with the lens off unless you're in manual mode. (2) The best focal length seems to be around 50mm, so either a 50mm prime or an 18-55mm kit lens would be perfect! (3) Obviously, you lose autofocus since your lens isn't attached to the camera. Focus is achieved by simply moving closer to or further away from the subject, and (4) The camera can't open up the aperture, so you'll do it with your hand. On the back of the lens (the side you mount on the camera), move the little plastic slider piece that controls the aperture. If you look in the lens while doing it, you'll see the hole open up. If you want to take this a step further, you can buy a reverse lens mount for $5 or $10 which should sharpen up the images quite a bit since it will hold the lens more solidly. Also, be sure to use a tripod when doing this or any other macro photography. With such fine detail, even a tiny movement can destroy the sharpness. This is an awesome trick for travel photographers. Sometimes you're at an amazing location, but there are people in the way of your shot. If you want to take a picture of a landmark and people are in your shot, you will likely spend the rest of your adult life cloning people out of the shot unless you try this technique. Step 1: Set your camera on a tripod. Step 2: Take a picture about every 10 seconds until you have about 15 shots, depending on how fast people are walking around. Step 3: Open all the images in Photoshop by going to File > Scripts > Statistics. Choose “median” and select the files you took. Step 4: Bam! 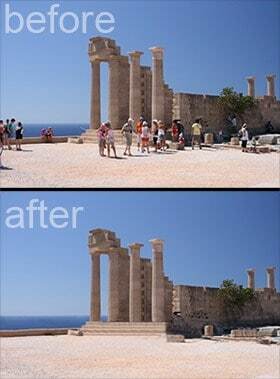 Photoshop finds what is different in the photos and simply removes it! Since the people moved around, it fills the area where someone was standing with part of another photo where no one was there. UPDATE: The “statistics” script mentioned here is only available in Photoshop Extended or in the Creative Cloud version of Photoshop; however, as someone mentioned in the comments, you can get a somewhat similar effect in recent versions of Photoshop Elements by going to Enhance > Photomerge > Scene Cleaner. This tip is mentioned in an outdated article on lifehacker. 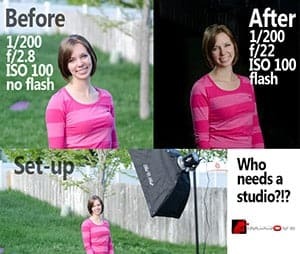 We all love to see beautiful bokeh in the background of our photos, but what you may not know is there is a really simple way that you can change the shape of the light bursts in your bokeh. 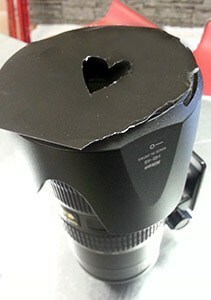 All you have to do is cut out a piece of black paper the size of the front element on your lens. Then, use a sharp kitchen knife or razor blade to cut a shape on in the middle of the paper. The shape should be slightly larger than a thumbnail or about the size of a U.S. nickel. Keep in mind that you'll only see this effect work if you are shooting with a large aperture, so a 50mm f/1.8 would be a great choice for this project. If you're shooting at f/5.6 on a kit lens, you likely won't see the effect at all. This is a photo of the setup for this technique. When you overexpose the background and crop the reflector out, it looks like a perfect white background. Sometimes when I'm shooting outdoor portraits, I see a pose or an expression for the model that makes me wish we were in the studio so I could photograph them on a white background. Sometimes a white background is the best way to focus all attention in the photo on the model, and it gives the photo a bright and clean look. When I'm in this situation, I often grab a simple $25 reflector and use it as a studio backdrop on the spot! The trick for making this technique work is to use positive exposure compensation. The camera will try and dim down the white background to a dull gray because it thinks the white is overexposed. About 1 stop of exposure compensation will make the reflector background look bright white. If you're still learning to shoot in manual mode or how exposure compensation works, you might take a look at my beginner photography class that I offer online. This is my all-time favorite landscape photography tip because I use it all the time and most people have never heard it before. When shooting landscapes, the sky is often much brighter than the rest of the landscape so you need something to darken down just that top part of the photo. A graduated neutral density filter does exactly that. A GND filter is a piece of glass that is darkened at the top and which gradually tapers off to clear. The photographer simply holds this filter in front of the lens to cover the sky and it darkens the sky without affecting the landscape underneath. Call me forgetful, but I often forget to bring my GND filter with me when I'm shooting landscapes, and it can ruin the shoot if I can't darken down the sky to balance the exposure. One trick I've learned is that you can simply use anything dark (a black piece of paper, a camera strap, etc) to hold in front of the lens for part of the exposure and the same thing is accomplished. For example, while filming video tutorials for my intermediate online photography class, I was shooting waterfalls in Oregon and needed to darken the sky without darkening the rest of the frame. Since it was early morning, I was using a 2 second exposure. All I had to do was hold my camera strap over the top half of the glass on my lens for 1 second, and then remove it. This makes it so the top half of the picture only sees light for half of the time, so it is much darker. And no, you won't see the camera strap in the photo since it's black. I debated whether or not this counts as a “camera trick” or if it's really just a super-awesome reflector that costs basically nothing. Call it what you will, but it works so well that I have to share this tip. Circular reflectors are excellent for improving the lighting in your outdoor portraits. By holding them to reflect the sun's light, you can fill in shadows and put beautiful highlights on the face of the person you're shooting. However, most circular reflectors only work for a head-and-shoulders shot and only for one person. You can purchase a large full-body reflector, but they usually cost around $70. The back side is white. One trick I learned from a photographer who shoots celebrities is to simply purchase insulation board for $5 and then cover the back and edges with white duct tape. 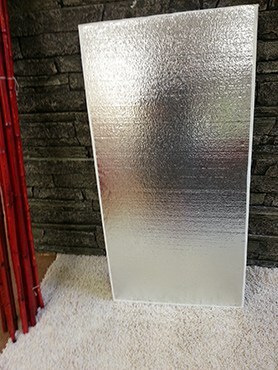 You'll find insulation board with reflective silver backing at any home improvement store. It comes in several sizes. I chose one that is 4 feet (1.2 meters) in height. This simple solution gives you a very large reflector that is lightweight, and you can use one side to reflect silver and the other side to reflect white. Awesome! Oh, and I also use this as a way to put a little wind in the hair of my models when I'm shooting someone with long hair. Just have an assistant fan up and down with the reflector board and it gives just the right amount of wind to give the hair some bounce without blowing the models away. 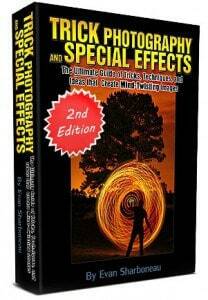 I can highly recommend Evan Sharbaneau's Trick Photography and Special Effects eBook if you're interested in learning more photography tricks. I've given a few ideas for photography tricks in this article, but this book really is quite good. I like that the book has so many projects of exactly how each photo is taken so you can use the ideas in your own photography.